I love to look at Mount Rosalie. From my sister-in-law's deck in Pine, Colorado, it's a pleasingly rounded summit, a dome blanketed in snow until late in the summer. Beside its 13,575-foot gentle rise, Mount Evans and Mount Bierstadt, both 14ers, appear harsh, craggy, forbidding. And yet Rosalie is deceptive. It is easy to summit Mount Rosalie from the Mount Evans road -- merely drive up the zigzagging road to just above Summit Lake, park, and hike south up and over Epaulet Mountain and then to Rosalie. But I'm not sure this counts as "climbing" Rosalie any more than parking at the lot on Evans and walking the final half mile to its summit counts as climbing that 14er. To climb Mount Rosalie, and say you've really done it, you must begin at the bottom -- and you must know the history of the person for whom the mountain is named -- and the controversy that surrounds it still. In 1863, when the painter Albert Bierstadt climbed the mountains known today as Evans and Bierstadt, Rosalie was not yet his wife. In fact, Rosalie was the wife of Bierstadt's friend, the American author and journalist Fitz Hugh Ludlow, whom Bierstadt had invited to accompany him on the trip west. Bierstadt did not even know Rosalie except from Ludlow's detailed descriptions. However, in just three years -- after mutual accusations of infidelity -- Rosalie and Ludlow would divorce and she would marry Bierstadt. Bierstadt's brazen honoring of her on the maps three years before, in the company of her husband, might lead us to wonder if their romance had already begun, at least in his artist's mind. For me, this dramatic scandal helps interpret Bierstadt's "A Storm in the Rocky Mountains, Mt. Rosalie," which he painted from sketches he did on that 1863 hike. I've always been a bit perplexed by Bierstadt's paintings, because, though I appreciate the light and grandeur and the clouds in them, they never represent the Rockies as they actually look, depicting them as far more jagged, more Eden-like. But if this painting is meant to convey Bierstadt's tumultuous love for his friend's wife, then it makes more sense. Rosalie was lovely, people said. Rosalie was a flirt, people said. Rosalie was popular and rich, people said. That she divorced a prominent journalist and art critic for a prominent painter seemed to only increase her celebrity status. In England, she and Albert met Queen Victoria; in Canada, they were the honored guests of a costume ball; in their winter home in Nassau and in their homes on the Hudson and in New York, they were regarded as American royalty. However, Rosalie was not a strong woman. Diagnosed with tuberculosis in 1876, she became increasingly frail and died in Nassau in 1893, at the age of 52. Her husband Albert Bierstadt would live only another nine years, to die at age 73. Why is the mountain named Rosalie? Rosalie the woman was nothing like the gentle dome that is currently named for her. This is particularly interesting when one realizes that the original Mount Rosalie -- in fact, the Mount Rosalie in Bierstadt's 1866 painting -- was what we call Mount Evans today. It's true: for three decades, Colorado had a 14er named after a woman. 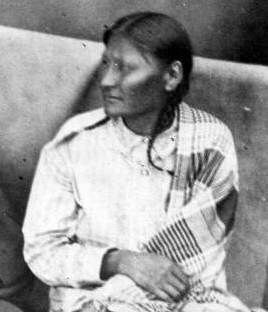 However, in 1895, the Colorado legislature changed the name of that peak to Evans to honor John Evans, who had been governor of Colorado from 1862-1865 and who had collaborated with the U.S. military's Colonel John Chivington to carry out the horrific November 29, 1864, Sand Creek Massacre against the Cheyenne and Arapaho. Too many places honor this despicable man on maps: Evanston, Illinois; Evanston, Wyoming; Evans, Colorado; Mount Evans (and Colorado's highest peak, Mount Elbert, honors Evans' son-in-law). In 1865, the Colorado legislature assured everyone that Rosalie Bierstadt would still be honored: the unnamed 13er near Bierstadt and Evans would be named Mount Rosalie. However, a campaign continues to restore Rosalie's name to its original peak, to honor an artist's wife and not an architect of genocide. I thought about all of this as I climbed the five miles from Deer Creek Campground to the summit of Rosalie last summer. From the saddle between Rosalie and Pegmatite Points, as I trudged west up Rosalie's sloping tundra side, I watched Mount Evans, the cars flashing on the road that winds up its side, and I thought about how shameful it is to give a beautiful mountain the name of a murderer. Privately, I re-named the peak known as Mount Evans Mount Mochi, after the 24-year-old Southern Cheyenne woman who became an avenging warrior after she survived the Sand Creek Massacre Evans had ordered. We should honor people like Mochi with our mountains' names. In fact, I think we would do far better to honor women like Mochi than women like Rosalie Bierstadt, whose fame stemmed from the wealth into which she was born and the men she happened to marry, not anything she accomplished or endured. 1. Drive 4.4 miles southwest of Pine Junction on US-285 (toward Bailey), and take a right at the gas station. This is Deer Creek Road. Drive 8.3 miles (note the lovely views of Rosalie as you drive) past the Deer Creek Campground and park at the road's end (and note, with the bafflement that I felt) that some people pitch their tents in gravel parking lots when there are ample beautiful sites in the woods along the creek. Start hiking on the Tanglewood Trail. 2. After about a mile, you'll reach the junction with the Rosalie Trail. It feels counterintuitive, but stay on the Tanglewood Trail (the righthand fork). 3. The trail switchbacks up through a lovely meadow and forest, and then through bristlecone pines to the tundra. About 3.25 miles from the trailhead, you reach the broad saddle between Rosalie and Pegmatite Points. The view here is lovely (I shared it with a pair of curious young deer with velvety antlers), and the Tanglewood Trail ambles invitingly onward into the Evans Wilderness. However, to hike Rosalie, leave the trail and hike west (to your left) toward Rosalie's summit. 4. The dome look of Rosalie translates to many false summits. Enjoy the views and the soft tundra, and examine the flowers as you catch your breath. The summit is up there. 5. From the top of Rosalie, the view is stunning, and the flat rocks are a perfect place to recline awhile in the silence and the solitude. In the hours I hiked Rosalie, I met only two other hikers. Compare that to the hundreds of hikers on Bierstadt and Evans each day. "At home in the huddle: Watertown, New York." Retrieved from http://athomeinthehuddle2013.blogspot.com/2013/03/its-garbage-day.html. Web. 13 July 2017. Enss, Chris. Mochi's War. TwoDot, 2015. "Mount Evans." Retrieved from https://en.wikipedia.org/wiki/Mount_Evans. Web. 13 July 2017. O'Neill, Tam. "Albert Bierstadt, Great Art, True Love!" Retrieved from http://www.tamoneillfinearts.com/albert-bierstadt-mt-rosalie/. Web. 13 July 2017. Another amazing blog Sarah!! I wondered (as i read) what does it take to petition the government to rename these peaks after people and women who gave back to society rather than those that stole from it!? Lady Moon, and being "good enough"